When studying responses to the Armory Show, it is easy to get lost in the progressive and conservative rhetoric that argued for and against the “new spirit” in art. However, while many engaged in a serious debate over the value of European modernism, several critics and artists used humor – from playful cartoons to malicious mockery – as a means of coming to terms with the radical new art on display. In addition to the cartoons, jokes, and jeers, the Armory Show prompted a number of spoofs and burlesques. 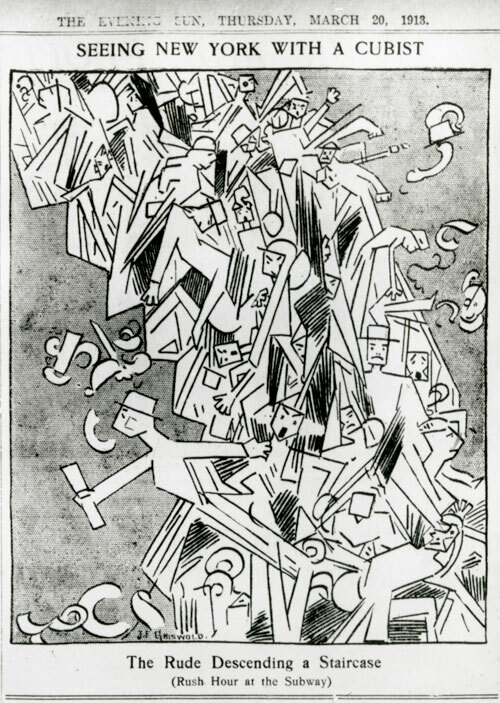 On March 11, 1913, the Architectural League held a boisterous buffet dinner and smoker where academic artists competed for a prize by painting parodies of Futurist, Cubist, and Post-Impressionist works. The following week, the “Academy of Misapplied Art” held a charity exhibition at New York’s Lighthouse for the Blind. Described in the press as a “Post-Mortem Armory Show” and a “Cubist Burlesque Show for Blind,” the artworks on display were said to “ignore drawing and every sane principle of Art” and bore satirical titles such as Food Descending a Staircase and U.S. Discards the Oval for the Cube. One wonders, however, how many of these spoofs and parodies were simply hiding the nervous insecurity that many felt about the advent of European modernism, for behind the laughter lay a very real anxiety about the future of art in America.